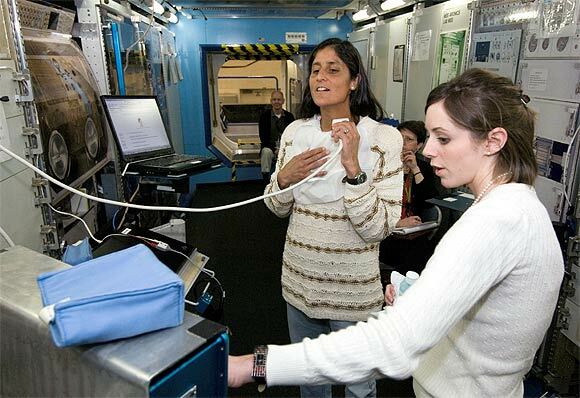 Indian-American astronaut Sunita Williams nee Pandya, who set a record for longest time spent in space by a woman -- during her first space journey in 2006 to the International Space Station aboard STS-116 -- is set to revisit the ISS for the second time in six years. Williams, who will launch July 14 from Baikonur Cosmodrome in Kazakhstan, has been training in Star City, home of Yuri Gagarin Cosmonaut Training Centre, near Russia for the past several months. Another feather to her cap came when she was named commander of the space station after the existing crew comes back two months after she and her fellow astronauts reach the ISS for expedition 32-33. Williams, who would launch on the Soyuz TMA-31S along with JAXA (Japanese Aerospace Exploration Agency) astronaut Aki Hoshide and cosmonaut Yuri Malenchenko, will dock with the ISS July 17 at 8.50 am Moscow time and join the current crew of Expedition 31, Joe Acaba, Gennady Padalka, and Sergei Valkov. "I am so excited. I can't really wait to go," Williams told Rediff.com's Suman Guha Mozumder in a brief telephone interview from Star City last week before being quarantined for the flight preparation. 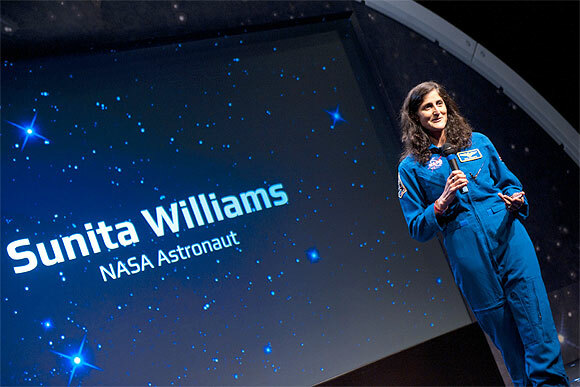 Williams, who holds three records for female space travellers -- longest spaceflight (195 days); four spacewalks; and 29 hours and 17 minutes of total time spent on spacewalks -- said she plans to return to Earth in November 2012, tentatively a week after the American presidential election. Hello Suni, great to hear you are going to space once again. So how is your pre-flight preparations going on over there? You can hear me, right? Thanks. Yeah, we've got you loud and clear. We're doing great. We've finished up all our exams here at Star City and everybody's taking a little bit of a break with their families before we get ready to go down to Baikonur. You are going to the ISS for the second time in six years. Do you have the same level of excitement and the 'overwhelming feeling' you told me you had the last time on the eve of your departure for ISS? Absolutely. It's been a little while for me -- it's been, like you said, six years since I went up on the space station last time. I actually can't wait to go. It's just a couple of weeks away, and it feels again like it's almost unbelievab#8804 like it's not going to happen. You know, this time I'm going to fly in a brand new spacecraft. So it's almost like doing the whole thing all over again. I'm really excited to go this time. Apart from the fact that you will be doing a lot of scientific research/experiments, what is it that makes this trip very special, very extraordinary, for you personally? That's a good question because, the last time, I was excited -- oh, this is the first time I'm going to go. This time I know it's a great place. I know I loved it a lot the last time. I can't wait to get back. The station itself is bigger. It's probably two times bigger than it was interior-wise when I was there the last time. We now have a crew of six versus three last time. That's going to make it exciting with more international partners participating. So there's a whole bunch of new things that are going to change from the last time. So I'm really looking forward to going back again. And I have a feeling when I'm up there, I'm not going to want to come home, just like I had that feeling last time. You said that you are kind of psyched to space travel. Given the fact that you will be the commander of the station this time, what kind of challenges do you think you will have when you're up there? I think they're already defined. Because as we grew as a team -- the crew in front of us, and the crew behind us -- we have sort of worked out how we want to operate. I think our team has gelled together. And so, being the commander is actually going to be for the most part pretty easy, because we've already figured out how we want to work up there. We'll see what happens when we get up there. I'm sure minor things will change, but for the most part we know a lot about each other. We know how each other works. We've worked with each other for the last two and a half years. And so it's like you with your brothers and sisters who you've known for a long time, and it's like you don't even have to really talk to each other because you know how the other one's going to act. My goal as the commander is to make everybody feel comfortable even in the training, and it is going to be a mirror to that while we're up in space. You came down from the ISS in 2006. Have you actually been missing your home in space? How emotional are you right now that you are going there once again? Absolutely. Like I mentioned earlier, I was sad to come back to Earth the last time, just because I didn't know if I'd ever get the chance to go back into space. Space felt like home. So having this opportunity to go back again is just overwhelming. I'm psyched. I can't wait to go back up there. Again, unfortunately or fortunately, I know I won't be up there forever. So I'm going to really enjoy the time that I have up in space. 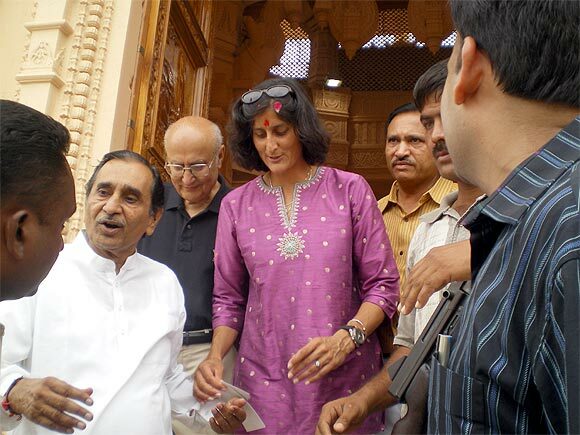 Last time I remember you had told me that you would carry a copy of the Bhagwad Gita to space. Are you taking it this time as well? Yes, of course. My father said that I have graduated a little bit (into Hindu religion and philosophy) and has given me a copy of the abridged English translation of the Upanishads and they'll be coming with me. I remember the last time you wanted to take along some samosas, I don't know whether you got to take them or not. Any chance of having samosas in space this time? Maybe. I think that might be a surprise for me. I heard a little bit of my family talking about it, and they're trying to keep it as a surprise. But we'll see when I get up there. I'll tell you from space. One last question before I let you go. What exactly have you been doing in terms of your training and how long has it been? We have been training in the Star City Cosmonaut Training Centre. We have gone through the whole launch exercise. We also did a day in the life on the space station, which included the worst malfunctions that could happen on the space station and we finished our final exams. And right now, we're just taking a week of rest before we head down for final quarantine, and our final training down there. Did you actually have to learn Russian a lot for this? Yeah, all of us who are flying on international space stations speak some Russian, and speak some English. Both the languages are needed to fly in a Russian spacecraft and communicate with your colleagues. Also, on the space station we primarily speak in English to our mission control centres down on the ground. So, yeah, our Russian colleagues speak English, and all of the Japanese, the Europeans, the Canadians, and the Americans speak Russian as well as English.